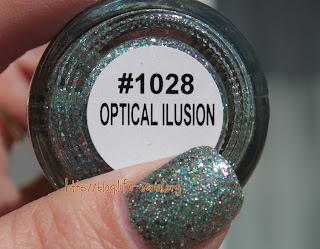 The one with China Glaze Prismatics Optical Illusion! POLISH! Polish. 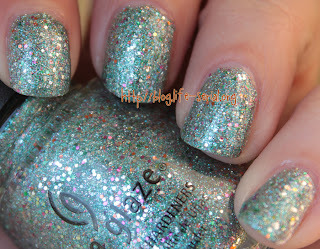 Today I have another of the China Glaze Prismatic collection. This one is called Optical Illusion, and I love it! Well, I love the colors. The formula, not so much. 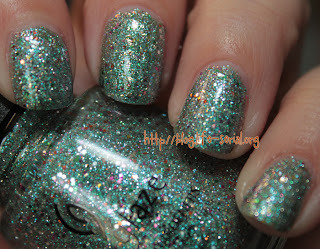 It's such a pretty mix of teal-y, aqua-y glitter with fleck in many colors, including pink, purple, orange and silver. I used two coats for these photos, as well as a thick layer of Poshe top coat to try to even it out. I think the flash photo just makes this polish look so deep! Not to mention shiny hahah I doubt I will be getting any more of the Prismatics, as the heavy glitter and I just don't agree. But they are beautiful polishes! Do you guy have any of them? You can visit China Glaze on the web or at their Facebook page. China Glaze polishes are available at Sally Beauty.